On May 15, 2018—three weeks before the provincial election—I received a personalized letter from Doug Ford pledging that a PC government would “find efficiencies, while protecting public sector jobs,” and that their platform policies “will only be achievable with a strong public sector workforce.” Mr. Ford repeated this promise for the duration of the campaign and for his first six months in office. Front-line workers are being laid off already. From the 45 AMAPCEO-represented staff at the Ontario Child Advocate who serve the province’s most vulnerable children and youth, to the staff working on the Indigenous Culture Fund at the Ontario Arts Council, to 100 nurses across the province, make no mistake that front-line positions are already being eliminated. And that hundreds more are being left vacant. Quality public services require quality public servants. Policy analysts, auditors, economists, scientists, program supervisors, and epidemiologists—among others—may not be on the “front-line” providing direct service, they are nonetheless critical to ensuring government programs are run efficiently and effectively. 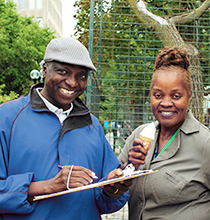 They are the experts the government will need to implement its agenda and deliver the “high-quality services” Premier Ford has promised. Indeed, if the government is committed to keeping its promises, it would do well to work with—not against—the talented, dedicated professionals that are planning and providing for our province. In January, I appeared before the Standing Committee on Finance and Economic Affairs and outlined just a handful of ways that the government can keep their promises of quality public services, of no public sector layoffs, of finding greater efficiencies, and increasing transparency and accountability. You can read our full submission here. Maintaining the current staffing complement of the Ontario Public Service. Ontario’s government already has far fewer public servants than other provinces, based on population. In fact, it’s 25% lower than British Columbia, the province with the next smallest ratio of public servants per population. Eliminating wasteful overspending on private consultants. Substantial efficiencies could be found immediately by stopping the use of private consultants, particularly in IT. Private consultants cost Ontarians an average of 30% more while yielding poorer outcomes. It’s also high time that Ontario institute a fair salary cap for public sector CEOs, executives, and special advisors to bring those costs back down to earth. Preserving independent offices of the Legislature. Merging the Ontario Child Advocate and the French Language Services Commissioner into the Ombudsman’s Office, and the Environmental Commissioner into the Auditor General’s Office will not lead to substantive cost efficiencies. What it will lead to is a worsening of public services and a lessening of governmental transparency and accountability. 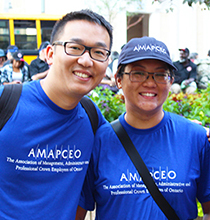 It’s clear: AMAPCEO members have the experience and expertise necessary to improve upon and deliver the services Ontarians rely on. For decades, our members have provided independent, professional policy and program expertise to PC, Liberal, and NDP governments. This government should be no different, and if Premier Ford is serious about his promises, it’s time to listen to the experts—and to place his trust in all of you.